Discussion in 'Announcements' started by Marindor, Feb 6, 2019. It seems your city is getting restless. Halflings are picking the first fruits of the year and start running around with them, sorcerers are conjuring up all kinds of fireworks and here and there, an occasional Orc is busy building stages. Once you start investigating the source of all this hassle, it becomes clear what causes it: Carnival is about to start! And some good news: You won't depend on chest chances to acquire this set, because all 5 buildings are obtainable as Grand Prizes, amongst many other buildings, by using your Flags. The Daily Rewards to contain some beautiful new buildings which can be combined into a float, but they won't act as Set Buildings so you don't need to do so. With the price in Flags of the Grand Prizes being different than before, there won't be days on which you can get double Flags, as we had with similar events in the past: you will be able to gain more Grand Prizes, even without them, though! The event will run from today until February 26th, so you have plenty of time to enjoy the festivities in your city! Please be advised that some event assets might still be missing in our current Mobile App version, but they will be implemented with a next update. We wish you a lot of joy with our Carnival event and would love to hear your feedback about it in our Feedback Thread! iDavis, Isil Rilma, Loki Blue and 2 others like this. As you might have read, today's game update brought a rebalancing, also in the order of the Grand Prizes for the Carnival Event. The reason is that the new order makes more sense from a game design perspective, which we realized as we saw people play the event on Beta. Unfortunately, this would also mean that some players would miss the opportunity to acquire a specific Set building (in this case e.g. the Banquet building, which was moved forward). 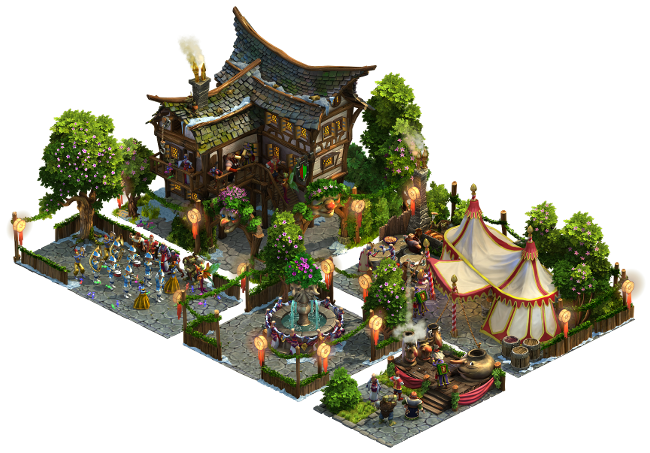 If this change caused you to miss out on the Banquet building and you would like to swap your Wishing Well (which was the first Grand Prize before) for a Banquet building, please send us a support request and we will be able to remove the Wishing Well for you and give you a Banquet in return. Golden Awaken, blackbudahflyb and iDavis like this.